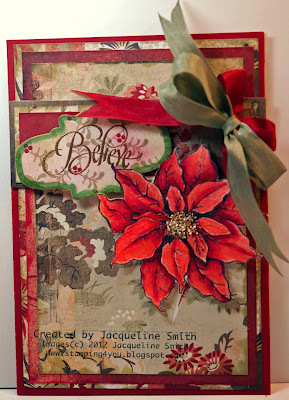 Loves Rubberstamps Blog: Beautiful Poinsetta! Sorry I didn't get to post yesterday, I had to work from 3am - 3pm. After work I had errands and by the time I got home and got supper made I crashed! So today I am sharing Jacqueline's BEAUTIFUL Christmas card that she created for her weekly inspirational project! Second - Don't forget to play along in this week's color challenge of - Espresso, Pumpkin & Aqua...these are great colors for those Fall & Halloween projects you are working on! Hope you have been having a wonderful weekend! This is so beautiful, love the colors!